LOUGH ERNE, Northern Ireland, June 19, 2013 (ENS) – Declarations of cooperation on climate change, extractive industries, nuclear safety and chemical weapons in Syria and marked this week’s meeting of the Group of Eight industrialized countries. “We recognise climate change as a contributing factor in increased economic and security risks globally,” they declared. “We remain strongly committed to addressing the urgent need to reduce greenhouse gas emissions significantly by 2020 and to pursue our low carbon path afterwards, with a view to doing our part to limit effectively the increase in global temperature below 2ºC above pre-industrial levels, consistent with science,” the leaders declared. The 2020 date is the internationally agreed deadline for a new protocol, legal instrument or an agreed outcome with legal force under the UN Framework Convention on Climate Change, UNFCCC, to govern greenhouse gas emissions. It must be adopted by 2015, to come into effect and be implemented from 2020. They welcomed the efforts of UN Secretary-General Ban Ki-moon “to mobilize political will through 2014 towards a successful global agreement in 2015” during the Conference of the Parties to the UNFCCC that France will host. “We also note with grave concern the gap between current country pledges and what is needed, and will work towards increasing mitigation ambition in the period to 2020,” the G8 leaders stated. They repeated their “commitment” to the Green Climate Fund, a stated goal of developed countries to jointly mobilize US$100 billion of climate finance per year by 2020. The G8 leaders said they will address rising aviation emissions by calling for agreement at the International Civil Aviation Organisation assembly in September on an ambitious package related to both market-based and non-market based measures. They will work together on further measures to address the issue of shipping emissions through the International Maritime Organisation. These pollutants – including black carbon, or soot; methane; tropospheric ozone; and refrigerants called hydrofluorocarbons, or HFCs – have relatively short atmospheric lifetimes but a sizeable warming impact on the climate, particularly in the Arctic and other vulnerable regions. Organized by the UN Environment Programme, the Climate and Clean Air Coalition is catalyzing rapid reductions in these pollutants to protect human health and the environment now and slow the rate of climate change within the first half of this century. The leaders said they are looking forward to the fifth Assessment Report of the International Panel on Climate Change, a body that gathers the input of thousands of climate scientists worldwide, due in 2014. Canadian Prime Minister Harper met privately with President Obama to urge the U.S. leader to sign a permit for the US$5.3-billion Keystone XL pipeline, through which the Canadian company TransCanada would transport 830,000 barrels of oil a day from Alberta’s tar sands to refineries on the Texas Gulf Coast. “We discussed a range of Canada-U.S. issues that you would expect – obviously, the Keystone pipeline,” Harper said during a closing news conference. “I think our respective positions are well known on that. Obama is expected to announce a final decision on the Keystone XL project later this year. Canada has been pushing public acceptance of the controversial pipeline with an advertising campaign across the United States in recent weeks. Environmental groups are opposed to the pipeline over the impact burning heavy tar sands oil would have on greenhouse gas emissions and damage to the environment if the pipeline is breached. 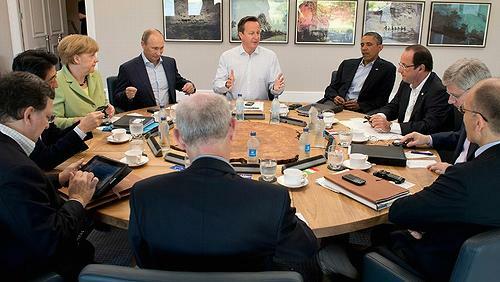 The G8 leaders called for increased transparency on land governance, open data and in extractive industries. The G8 leaders said they will “take action” to raise global standards for extractives transparency and make progress towards common global reporting standards, both for countries with domestic extractive industries and the home countries of large multinational extractives corporations. Under these common standards, companies would be required to report on extractives payments, governments would take steps to ensure disclosure compliance, and those governments that wish to move towards the Extractives Industries Transparency Initiative, EITI, standard will voluntarily report their revenues. Thirty-nine countries already have signed up to the EITI, which adopted new rules in May to increase the coverage and accessibility of data produced by EITI countries and ensure that participating countries are held to a high standard. These will require mandatory reporting of payments to governments by all listed and large unlisted extractive companies in the EU to all governments, and are consistent with section 1504 of the U.S. Dodd Frank legislation and the new EITI standard. 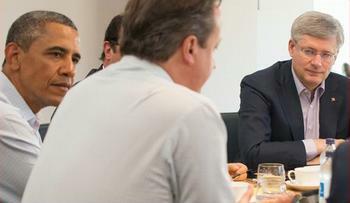 The United States, United Kingdom and France will seek candidacy status for the new EITI standard by 2014, the G8 leaders said. Canada will launch consultations with stakeholders across Canada with a view to developing an equivalent mandatory reporting regime for extractive companies within the next two years. Italy will seek candidacy status for the new EITI standard as soon as possible. Germany is planning to test EITI implementation in a pilot region in view of a future candidacy as implementation country. Russia and Japan support the goal of EITI and will encourage national companies to become supporters. They pledged to support responsible, conflict-free sourcing of minerals, including gold, diamonds and other precious stones, and responsible sourcing in the artisanal mining sector, particularly from conflict and high-risk areas. This week the G8 launched initial partnerships with developing countries to improve transparency and governance in the extractive sector by 2015. Canada partnered with Peru and Tanzania, France partnered with Burkina Faso, the European Union with Colombia, Germany with Mongolia, the UK with Ghana, and the United States with Burma/Myanmar and with Guinea. In a parallel effort to improve land governance and transparency in land transactions by 2015, the G8 countries launched similar initial partnerships. France partnered with Senegal, the European Union with Niger and South Sudan, Germany with Namibia, the UK with Nigeria and Tanzania, and the United States with Burkina Faso. These partnerships will be tailored to the needs of each country and support national development plans, the leaders said. The G8 leaders condemned any use of chemical weapons in Syria and called on all parties to the conflict to allow access to the UN investigating team mandated by the UN Secretary-General. The UN team will deliver their report to the UN Security Council. The G8 leaders emphasized the importance of international cooperation and pledged their “full support” to the UN International Atomic Energy Agency’s Action Plan on Nuclear Safety. 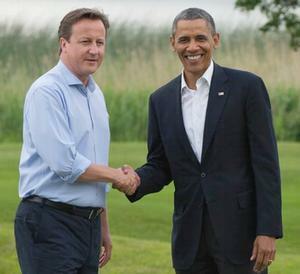 The Presidency of the G8 rotates each calendar year. The UK holds the Presidency throughout 2013. In 2014, Russia will take the Presidency.